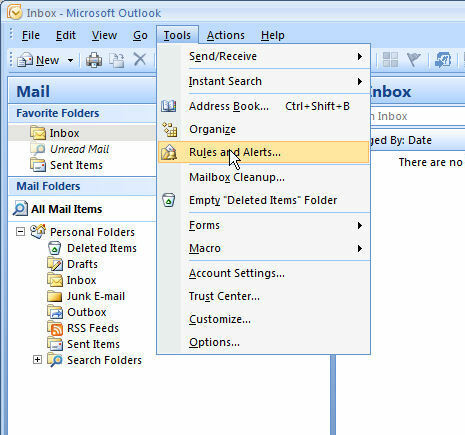 When the following instructions are completed, the Outlook rule will filter all incoming messages. 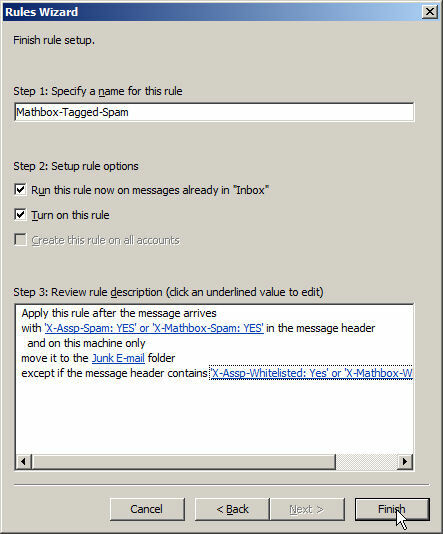 When the rule finds a message that Mathbox has tagged as spam, the tagged spam message is moved the the Outlook Junk folder. This rule cleans up your Inbox, yet saves the tagged messages for review. The following instructions apply to both Outlook 2007 and Outlook 2010. The images are from Outlook 2007. Depending on your Outlook settings, the Tools menu item may be in a different location. 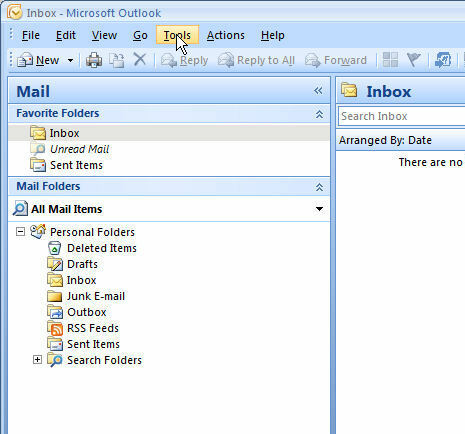 However, once you have located the the Tools menu item, the instructions are identical for both versions of Outlook. Locate the Tools menu item. Click the Tools menu item. Then locate the Rules and Alerts... menu item. Click the Rules and Alerts... menu item. 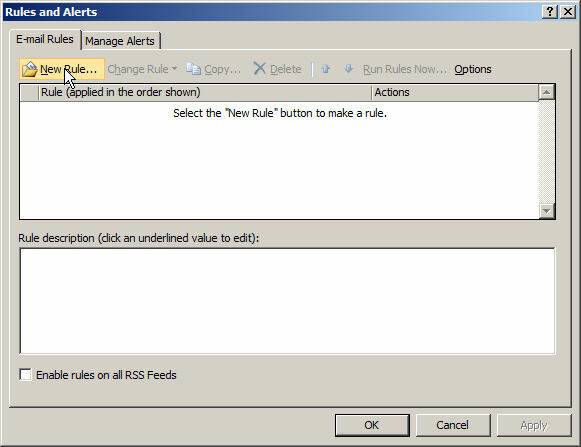 On the resulting Rules and Alerts dialog, locate the New Rule menu item. Click the New Rule menu item. 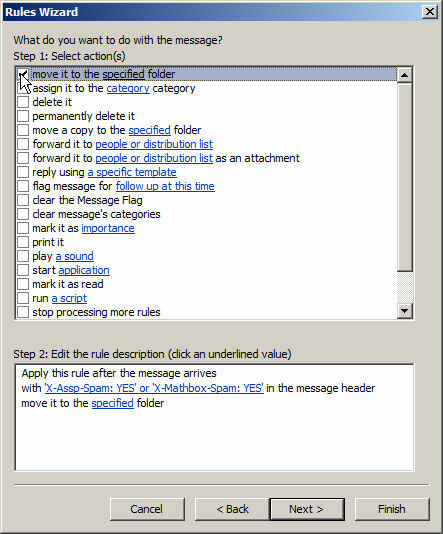 On the resulting Rule Wizard dialog, locate the Check messages when they arrive item under the Start from a blank rule label. Select (click) the Check messages when they arrive item. Click the Next button. 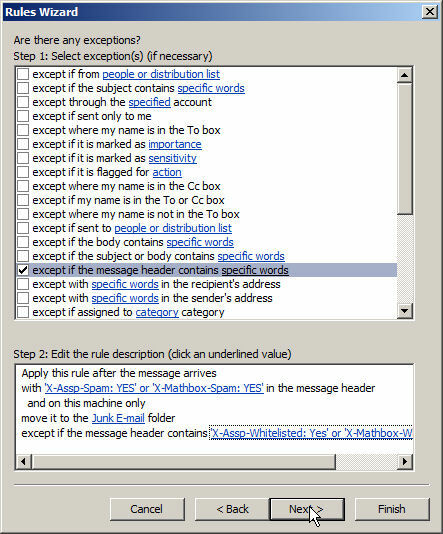 In the Step 1 box, click (check) the checkbox to the left of with specific words in the message header item. The line, with specific words in the message header will appear in the Step 2 box. In the Step 2 box, click specific words. In the Search Text dialog, type X-Assp-Spam: YES and click Add. 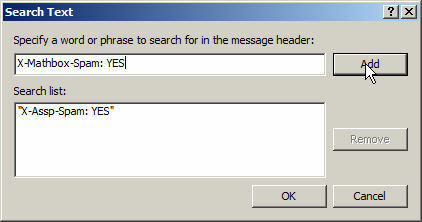 In the Search Text dialog, type X-Mathbox-Spam: YES and click Add. 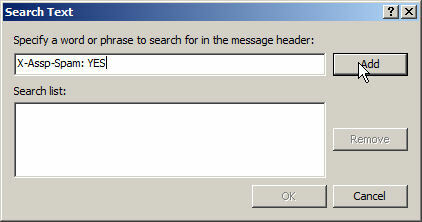 If the Search Text dialog does not look like the image below, use the Remove and/or Add buttons to correct any errors. When any errors have been corrected, click the OK button. The Step 2 box should now appear like the image below. If not, click the Back button and correct any errors. Otherwise, click the Next button. In the Step 1 box, click (check) the checkbox to the left of move it to the specified folder item. The line, move it to the specified folder will appear in the Step 2 box. 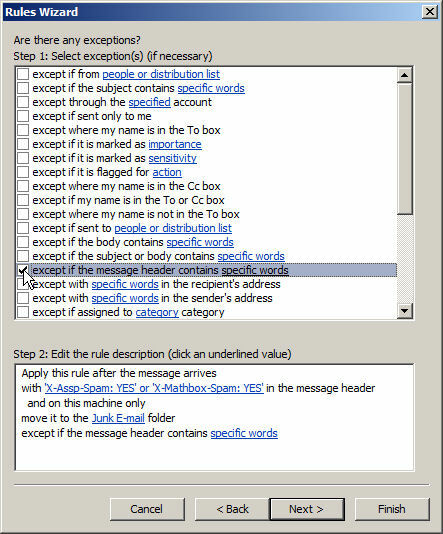 In the Step 2 box, click specified, as in the image below. In the Choose a folder dialog, select (click) the Junk E-mail folder item. 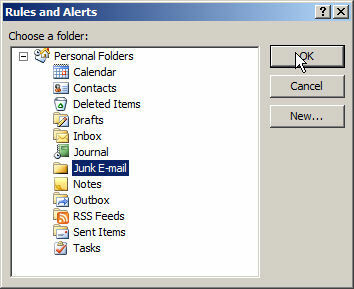 After ensuring the Junk E-mail folder is selected, click the OK button. The following steps protect messages that are tagged as spam, but the sender has been white listed by Mathbox to your email address or the domain of your email address. In the Step 1 box, click (check) the checkbox to the left of except if the message header contains specific words item. 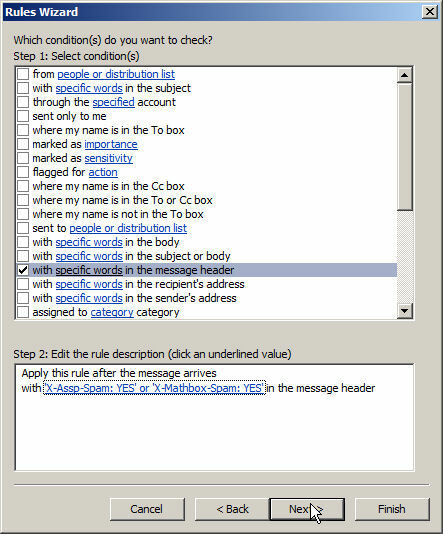 The line, except if the message header contains specific words will appear in the Step 2 box. In the Step 2 box, click specific words, as in the image below. In the Search Text dialog, type X-Assp-Whitelisted: Yes and click Add. In the Search Text dialog, type X-Mathbox-Whitelisted: Yes and click Add. You must name the new rule. Enter Mathbox-Tagged-Spam in the Step 1 edit field. 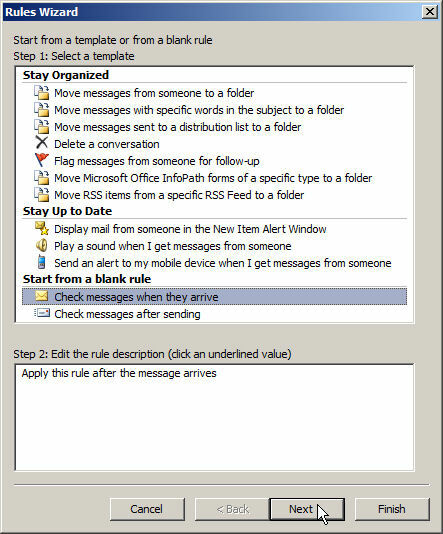 Normally, this rule is run only on new incoming messages. However, it can be run against messages already in your Inbox. 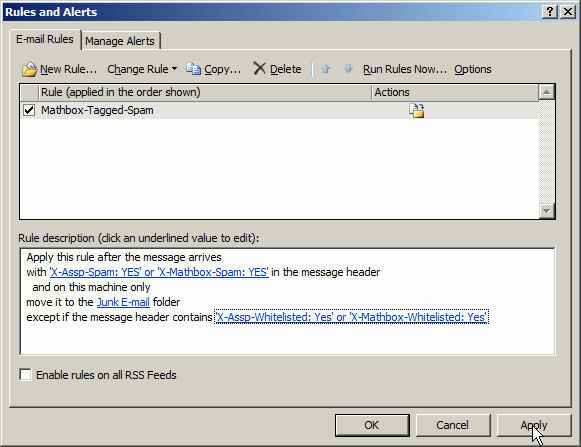 To clean up your Inbox, click (check) the checkbox to the left of Run the rule now on messages already in "Inbox".